The Limerick college were far too strong for GMIT today. Clare's Colm Galvin and Limerick's Cian Lynch in action for victorious Mary Immaculate today. 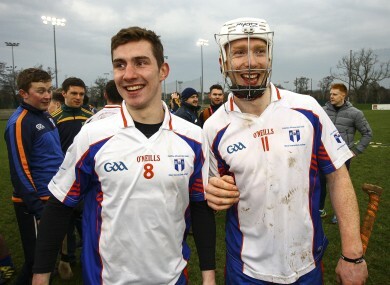 CIAN LYNCH SCORED 1-2 as reigning champions Mary Immaculate College began their Fitzgibbon Cup Group A campaign with a comprehensive victory over GMIT at Mary Immaculate College. The hosts claimed last year’s title after a 1-30 to 3-22 victory against University of Limerick in the final. But since then Eamonn Cregan parted company and Jamie Wall took control. Mary I were raging hot favourites coming into the game and they led 1-16 to 0-8 at half-time with Darragh O’Donovan scoring four first-half points and Lynch scoring their goal – Thomas Grimes added the second late on. Other star names like Ronan Maher, Colm Galvin and Richie English remained from last year’s victorious panel, with Declan Hannon the only notable absentee. Mary I stormed into the game and Micheal O’Neill scored their first point in the second minute. The sides were level for the first time five minutes later when Jarlath Mannion scored for GMIT but Mary I were dominant. Lynch scored his goal two minutes before half-time, when the Limerick forward profited off the hard work of Thomas Monaghan and Sean Burke. Mary I were 11 points clear at half-time and Aaron Gillane scored again on the resumption, but to their credit GMIT stuck with them and ace free-taker Alan Ward added to his personal tally – he finished with eight points. But Mary I were too good, and they were able to rest Lynch from the 36th minute, as they brought on their bench and substitute Grimes, who replaced Burke, finished the game off with their second goal in the 50th minute. Scorers for Mary Immaculate College: Darragh O’Donovan 0-8 (0-1f, 0-1 sl), Cian Lynch, Thomas Grimes 1-2 each, Aaron Gillane 0-5 (0-1f), Thomas Monaghan, Michael O’Neill 0-4, Ronan Maher 0-3, Colm Galvin 0-2, Eoin Quirke 0-1. Scorers for GMIT: Alan Ward 0-8 (0-6f, 0-1 65), Jarlath Mannion, Jack Forde 0-2 each, Iomar Creaven, Joseph Mooney, Liam Kelly, Richard Doyle 0-1 each. Email “Limerick and Clare stars to the fore as Fitzgibbon champs Mary I claim 21-point success”. Feedback on “Limerick and Clare stars to the fore as Fitzgibbon champs Mary I claim 21-point success”.